If you’re living paycheck to paycheck then you know it’s an incredibly stressful way to live. And chances are, some months you have to go into debt to manage your expenses. This debt can snowball and before you know it you’re in over your head. 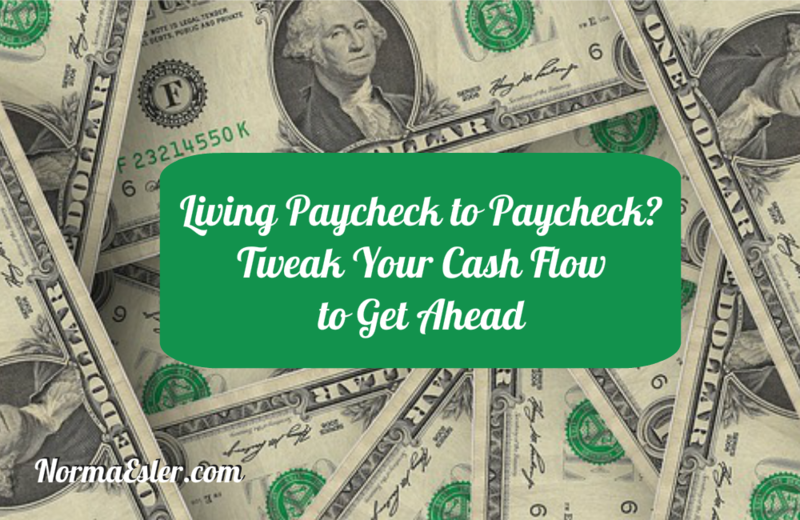 You might be surprised to know that a few tweaks to your cash flow can make a huge difference in your life. If you don’t have a budget, make one. Right now. Today. A budget will quickly show you where you’re spending your money and where you might be able to save. And instead of making a traditional budget, create one that lists when your income is received (when do you get paid?) and when are your bills due. This simple step will help you see when you have money coming in and when it’s going out. Using the dates on your budget, you can begin to see when you often have money in your account and when you don’t. This is important and it can help you save. For example, imagine you get paid on the first and your bills aren’t due until the twentieth. That leaves you twenty days to spend your money and by the time the twentieth rolls around you don’t have enough to cover your bills. Change your dates to better match your payment dates. If you get paid on the first, set your bills to be paid on the fifth. And if you can’t change your payment dates, pay the bill ahead of time or set the money aside in a separate account so you don’t spend it. If you’re often over budget, cut out your luxuries for a few months. This accomplishes two things. It helps you see what luxuries are really worth your money and which ones aren’t. It also helps you get caught up with your debt. When you’re back in the black, you can begin to add a few important luxuries back into your budget. Finally, create an emergency fund. Do this before you pay down any debt. Your emergency fund may take months to create. Do it anyway. If you can only save ten dollars a week then that’s all you can save. The goal is to set aside a thousand dollars in a separate account. This account shouldn’t be too easy to access. It’s for emergencies. Now, whenever you unintentionally exceed your budget you don’t have to panic or go into debt. You can borrow from your emergency fund to make up the difference.